Jonglei is a state of South Sudan. On 2 October 2015 the President Salva Kiir Mayardit decreed the creation of the new Jonglei State along with 27 other states replacing 10 previous states. The earlier Jonglei state comprised three counties of Bor, Twic East and Duk and was the largest state by area before reorganisation, with approximately 122,581 km2, as well as the most populous according to the controversial 2008 census conducted during present-day South Sudan's second period of autonomy. Bor is the capital of the state. The current governor of Jonglei State is Colonel Philip Aguer Panyang. Jonglei seceded from Sudan as part of the Republic of South Sudan on 9 July 2011. In the 21st century, Jonglei has been marred by clashes between tribes of the region which the UN estimated in May 2012 had affected the lives of over 140,000 people, and has been heavily influenced by the broader South Sudanese conflict since December 2013. In addition to the 14 counties, Governor Philip Aguer Panyang secretly requested 3 additional counties two o which (Paliau and Kongor) will add to the former Twic East Counties and one (Pagak) will add to former Duk. Once announced, the total number of counties will hike to 17. The capital of the state, Mading Bor, became an administrative centre under the Anglo-Egyptian Sudan (1899 -1956) for the Dinka people. It was in Malek, a small settlement, about 19 kilometres (12 mi), south of Msding Bor that the first modern Christian mission in present-day South Sudan was established by Archibald Shaw in December 1905. Bor became the first area to host a Church Missionary Society station in 1905. Shaw opened the first primary school in Malek. This school produced the first indigenous Anglican bishop to be consecrated in Dinkaland, Daniel Deng Atong. John Aruor became the first legend to be baptized in 1916 in Mading Bor. In 1912, the British established Pibor Post, a colonial era outpost which was originally called Fort Bruce in the eastern part of Jonglei. From 1919 to 1976, the territory of today's state of Jonglei belonged to the state of the Upper Nile in what was initially Anglo-Egyptian Sudan. Jonglei has a long history of unrest which affected other parts of Sudan. The First Sudanese Civil War which lasted from 1955 until 1972 broke out with a Southern rebellion in Torit in Jonglei state) against Northern armed officers. In 1983, the Second Sudanese Civil War also broke out on the Nile in Jonglei. In the 1970s, the Jonglei Investigation Team was established by the Sudanese government to investigate affairs and development potential in the region. In 1976, Jonglei was split off from the Upper Nile as a separate province. Construction of the Jonglei Canal project, a 360 km long canal between Mading Bor and where the Sobat River joins the White Nile began construction in 1978 but was halted in 1983-4 for political, financial and technical reasons. From 1991 to 1994, the territory was again included within the newly defined borders of Upper Nile State. On 14 February 1994, Jonglei was again split off as a separate state. Jonglei has long suffered from tribal infighting. Much of the conflict is over basic resources of food, land, and water, and personal grudges related to the abduction of women and children and theft of cattle. In November and December 2007, clashes between Murle and Dinke tribesmen had worsened to revenge attacks, killing over 34 people and injuring over 100. On one outbreak in late November 2007, eight Dinka tribesmen and 7,000 cattle were stole near the village of Padak, about 20 kilometres north-east of Bor. Many fled to the Kakuma Camp in northwestern Kenya, and they amounted to some 85 percent of the total 3,000 or so refugees reaching the camp. Violence between Murle and Nuer tribes has been central to the attacks in the state. The Geneva Small Arms Survey concluded that the "Murle–Lou Nuer conflict in Jonglei State is indicative of how tribal and political dynamics are intertwined in the post-CPA period." A civilian disarmament operation targeting primarily the Nuer communities in 2005-06 resulted in a major outbreak of violence against the authorities, who believed that the crackdown was politically motivated. In August 2007, some 80 people were killed in Murle–Lou Nuer clashes. In 2009 alone, some 86,000 people were displaced, and at least 1248 killed as a result of violent clashes. One attack at Lewongole in March 2009 claimed 450 lives, wounding 45 and displacing 5000 people. A month later, 250 were killed, 70 wounded and 15,000 displaced at Akoko. 24,000 were displaced as a result of attack in August 2009 at Panyangor. Between January 2011 and September 2012, some 2600 people died in clashes in Jonglei State. In January 2012 clashes between Murle and Nuer tribes again broke out over cattle. Outbreaks between Nuer and Murle people have been the most severe in Nyirol and Pibor counties but have also affected other counties. In May 2012, state governor, Kuol Manyang Juuk stated that 3,651 people had been killed, 385 people wounded, 1,830 children abducted, and 3,983,613 cattle stolen. The UN estimated at the time that ongoing clashes had affected the lives of over 140,000 people. The Sudan People's Liberation Army (SPLA), international defence forces, and UN Peacekeepers are struggling to defuse the ongoing conflict and protect civilians against raids. The Jonglei Peace Conference was signed on 6 May 2012 in Bor, and has since been trying to improve the situation in the region. Despite the peace agreement, attacks continued to follow. 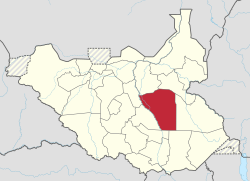 On 9 May 2012 two people were killed and one was injured in an attack by the Murle on 32 cows in Twic East. A day later, a car traveling from Juba to Jonglei belonging to the South Sudan Ministry of Roads and Bridges was attacked near Panwell village in Bangachorot, killing the driver and wounding two policemen. In January 2013, more than 100 people, mainly women and children, were slaughtered during cattle raids. In February 2013, 114 civilians, mainly women and children, along with 14 SPLA soldiers, were killed in Walgak after the community was attacked by the rebel group of David Yau Yau and Murle youth. On 9 April 2013, five Indian UNMISS troops and seven civilian UN employees (two UN staff and five contractors) were killed in a rebel ambush in Jonglei while escorting a UN convoy between Pibor and Bor. Nine further UN employees, both military and civilian, were wounded and some remain missing. Four of the civilians killed were Kenyan contractors working to drill water boreholes. One of the dead soldiers was a lieutenant-colonel and one of the wounded was a captain. According to South Sudan's military spokesman, the convoy was attacked by Yau Yau's rebel forces that they believe are supported by the Sudanese government. UNMISS said that 200 armed men were involved in the attack and that their convoy was escorted by 32 Indian UN peacekeepers. The attackers were equipped with rocket propelled grenades. A UN spokesman said that the fierce resistance put up by their peacekeepers forced the rebels to withdraw and saved the lives of many of the civilians. UN Secretary-General Ban Ki Moon labelled the killings a war crime, and called for the perpetrators to be brought to justice. Rebel group South Sudan Democratic Movement/Army (SSDM/A) denied responsibility for the murders of the UN peacekeepers. Jonglei, which covers an area of 122,581 square kilometres (47,329 sq mi), forms the bulk of the eastern part of South Sudan covering most of the eastern centre. Located in the Greater Upper Nile region, it is bordered by Upper Nile State to the north, Unity State to the northwest and west, Lakes State to the southwest, Central Equatoria to the southwest, Eastern Equatoria to the south, and Ethiopia to the east. The principal town, Bor, lies in the southwestern corner of the state. Other towns include Akobo, Ayod, Fangak, Padak, Pibor, Pochalla and Waat. The principal rivers are the White Nile, which flows in the western part of the state, and the Pibor River, which flows in the central-east. The Pibor and its tributaries drain a watershed 10,000 km2 (3,900 sq mi) in size. The river's mean annual discharge at its mouth is 98 m³/s (3,460 ft³/s). In the southern part of the state is the Kenamuke Swamp (Kobowen), a wetland which is part of the Boma National Park. In June 2007, Animal Geographic Magazine estimated that over 1.3 million animals lived in Boma National Park. It is "home to one of the largest migrations in the world with an estimated 800,000 white-eared kob antelope, 250,000 Mongalla gazelle and some 160,000 tiang moving across Jonglei State", according to the Wildlife Conservation Society. Jonglei is a very poor state. The economy of Jonglei is mostly dependent upon livestock, and most inhabitants are employed in the agricultural sector. UNEP says that the Dinka people of the state are "agro-pastoralists, combining cattle-rearing with wet season agriculture, and migrating seasonally according to the rains and the inundation of the toic (seasonal floodplains)." Most of Jonglei State falls within the oil development Block B, which was granted to Total S.A. before independence. Chevron Oil has been one of the major developers of oil extraction in Jonglei. Exploration of petroleum has been stalled by ongoing (as of January 2013) violence. The Jonglei Canal Project, formulated in the mid 1970s to build a 360 km long canal between Bor and where the Sobat River joins the White Nile in the far north near Malakal, is the most prominent project to have ever been conducted in the state and is also one of its greatest failures. Construction began in 1978 but was halted in 1983-4 for political, financial and technical reasons, and today abandoned machinery used to construct the canal is rusting away. The project was a highly controversial one, and in 1979 the Wildlife Clubs of South Sudan (WCSS) was established, which led the campaign against its construction. The building of the canal had a negative impact on the lives of thousands of people in local communities who had to be displaced to accommodate for the canal, and "deprived them of dry-season grazing land for their cattle and other livestock". Although New Scientist said in 1983 that the impact of the canal which by-passed a large area of the Sudd swamps was unclear, more recently experts have concluded that it would have had a devastating impact upon the vast wetland in the south of the state which is a unique ecosystem for a diversity of wildlife, drying it up. Researchers from Iowa State University concluded that the canal project to provide irrigation had always been a lost cause and would have proved ineffective and that future agricultural development in southern Sudan could only be achieved by rain-fed crops and mechanized agriculture. Whittington and McClelland in 1992, however, evaluated the opportunity costs of the Jonglei Canal I project at $US 500 million. The main hospital and schools are in Bor. Access to adequate healthcare in the state is extremely poor, and the situation has worsened since 2009 when Médecins Sans Frontières Belgium, who had been running the Bor Hospital, pulled out of the country amidst security concerns. Dr Samuel Legato Agat, a doctor at the hospital, was trained in Cuba and Canada, but most staff at the hospital as of 2012 were illiterate and incapable of producing documentation for patients. Kenya Commercial Bank (South Sudan) maintains a branch in Bor. The main transport connections are Bor Airport at Bor, in addition to river traffic on the White Nile and three major roads that lead out of Bor to other parts of South Sudan. Jonglei State is inhabited mostly by Dinka (Monyjang/Jieng) and the Nuer people. The John Garang Memorial University of Science and Technology, one of the seven public universities in the country, is located in Bor. The university, founded by the former governor of Jonglei State, Philip Thon Leek, is named after John Garang de Mabior (June 23, 1945 – July 30, 2005). Garang is considered the founder of the modern South Sudan having led the South Sudanese movement Sudan People's Liberation Army/Movement. He signed the Comprehensive Peace Agreement in 2005, an event which culminated in the independence of South Sudan in 2011. Garang died in a helicopter crash in 2005, 21 days following his swearing in as first Vice President of Sudan and President of the Autonomous South Sudan. ^ "Statistical Yearbook for Southern Sudan 2010" (PDF). Southern Sudan Centre for Census, Statistics and Evaluation. Archived from the original (PDF) on 2012-10-18. Retrieved 2012-06-01. ^ Guarak, Mawut Achiecque Mach (21 February 2011). Integration and Fragmentation of the Sudan: An African Renaissance. AuthorHouse. p. 72. ISBN 978-1-4567-2357-6. Retrieved 13 April 2013. ^ Tarrósy, István; Szabó, Loránd; Hydén, Göran (2011). The African State in a Changing Global Context: Breakdowns and Transformations. LIT Verlag Münster. p. 112. ISBN 978-3-643-11060-2. Retrieved 13 April 2013. ^ Natsios, Andrew S. (15 February 2012). Sudan, South Sudan, and Darfur:What Everyone Needs to Know. Oxford University Press. p. 110. ISBN 978-0-19-983137-1. Retrieved 13 April 2013. ^ Kulusika, Simon E. (2004). South Sudan right of self-determination and establishment of new sovereign state: a legal analysis. University of Zambia Press. p. 11. ISBN 978-9982-03-020-5. Retrieved 13 April 2013. ^ a b Hughes, Ralph H.; Hughes, Jane S.; Bernacsek, G. M. (1992). Iucn Directory of African Wetlands. IUCN. p. 221. ISBN 978-2-88032-949-5. Retrieved 13 April 2013. ^ "States of Sudan", Statoids. Retrieved 13 April 2013. ^ a b Great Britain. Parliament. House of Commons. International Development Committee (1 April 2012). South Sudan: Prospects for Peace and Development, Fifteenth Report of Session 2010-12, Vol. 1: Report, Together with Formal Minutes, Oral and Written Evidence. The Stationery Office. p. 84. ISBN 978-0-215-04373-3. Retrieved 13 April 2013. ^ Trafficking in Persons Report (10th Ed. ). DIANE Publishing. November 2010. p. 306. ISBN 978-1-4379-3716-9. Retrieved 13 April 2013. ^ a b "UNHCR suspends returns to Sudan's Jonglei state". UNHCR. Retrieved 3 April 2013. ^ a b c d Geneva Small Arms Survey (3 June 2010). Small Arms Survey 2010: Gangs, Groups, and Guns. Cambridge University Press. p. 286. ISBN 978-0-521-19711-3. Retrieved 13 April 2013. ^ "There is No Protection": Insecurity and Human Rights in Southern Sudan. Human Rights Watch. 2009. p. 26. ISBN 978-1-56432-436-8. Retrieved 13 April 2013. ^ Young, John (2007). Sudan People's Liberation Army: disarmament in Jonglei and its implications. Institute for Security Studies, South Africa. p. 1. Retrieved 13 April 2013. ^ Year in Review 2007: United Nations Peace Operations. United Nations Publications. 1 April 2008. p. 11. ISBN 978-92-1-101168-5. Retrieved 13 April 2013. ^ a b "South Sudan Women Seek Jonglei Peacemaking Role". Voice of America. Retrieved 13 April 2013. ^ "UN: Hundreds dead in South Sudan tribal clash". Al Jazeera. 4 January 2012. Retrieved 13 April 2013. ^ "Jonglei: Nyirol raid kills mother and child - official". Sudan Tribune. 31 December 2012. Retrieved 13 April 2013. ^ a b c "Jonglei's Greater Akobo area holds peace conference". Sudan Tribune, accessed via HighBeam Research. 12 May 2012. Archived from the original on 15 March 2016. Retrieved 13 April 2013. ^ "Jonglei peace deal may not stop violence". Sudan Tribune, accessed via HighBeam Research. 5 May 2012. Archived from the original on 15 November 2018. Retrieved 13 April 2013. ^ "South Sudan's Jonglei swears in three new county commissioners". Sudan Tribune, accessed via HighBeam Research. 18 March 2013. Retrieved 13 April 2013. ^ "UN peacekeepers killed in South Sudan ambush". Al Jazeera. 10 April 2013. Retrieved 10 April 2013. ^ Pandit, Rajat (10 April 2013). "Five Indian peacekeepers killed in South Sudan ambush". The Times of India. Retrieved 10 April 2013. ^ a b c d Associated Press (9 April 2013). "5 UN peacekeepers, 7 others killed in gunfire attack in South Sudan, officials say". Washington Post. Retrieved 9 April 2013. ^ a b "Gunmen kill 4 Kenyans on Sudan water drilling mission". Business Daily Africa. 10 April 2013. Retrieved 10 April 2013. ^ "Bodies of five martyrs likely to reach India tonight". First Post. 10 April 2013. Retrieved 10 April 2013. ^ Dikshit, Sandeep (9 April 2013). "Killing of peacekeepers a war crime: Ban ki-Moon". The Hindu. Retrieved 9 April 2013. ^ "We didn't kill UN peacekeepers in Jonglei: rebel group". Sudan Tribune. 9 April 2013. Retrieved 13 April 2013. ^ Shahin, M. (30 November 2002). Hydrology and Water Resources of Africa. Springer. pp. 276, 288. ISBN 978-1-4020-0866-5. Retrieved 13 April 2013. ^ a b Guarak, Mawut Achiecque Mach (21 February 2011). Integration and Fragmentation of the Sudan: An African Renaissance. AuthorHouse. p. 668. ISBN 978-1-4567-2357-6. Retrieved 13 April 2013. ^ Clammer, Paul (2009). Sudan. Bradt Travel Guides. p. 15. ISBN 978-1-84162-206-4. Retrieved 13 April 2013. ^ Sudan: Post-Conflict Environmental Assessment. UNEP/Earthprint. 2007. p. 114. ISBN 978-92-807-2702-9. Retrieved 13 April 2013. ^ McDoom, Opheera (25 May 2010). "UN evacuates 10 aid staff after south Sudan clashes". Reuters. Juba. Retrieved 29 January 2013. ^ Sudan Oil and Gas Exploration Laws and Regulation Handbook. Int'l Business Publications. 3 March 2008. p. 28. ISBN 978-1-4330-7897-2. Retrieved 13 April 2013. ^ "South Sudan: Jonglei Hopes for Oil Production in 2013". Sudan Tribune. 24 December 2012. Retrieved 31 January 2013. ^ Haggett, Peter (1 July 2001). Encyclopedia of World Geography. Marshall Cavendish. p. 2210. ISBN 978-0-7614-7289-6. Retrieved 13 April 2013. ^ Rotberg, Robert I. (2003). State failure and state weakness in a time of terror. Brookings Institution Press. p. 116. ISBN 978-0-8157-7572-0. Retrieved 13 April 2013. ^ New Scientist. Reed Business Information. 11 August 1983. p. 421. ISSN 0262-4079. Retrieved 13 April 2013. ^ Hughes, J. Donald (14 October 2009). An Environmental History of the World: Humankind's Changing Role in the Community of Life. Routledge. p. 181. ISBN 978-0-203-88575-8. Retrieved 13 April 2013. ^ Erlikh, Ḥagai; Gershoni, Israel (2000). The Nile: Histories, Conflicts, Myths. Lynne Rienner Publishers. p. 263. ISBN 978-1-55587-672-2. Retrieved 13 April 2013. ^ Collins, Robert O. (1988). Jonglei: a history of the hydropolitics of the Nile. p. 44. Retrieved 13 April 2013. ^ Brauch, Hans Günter (2009). Facing Global Environmental Change: Environmental, Human, Energy, Food, Health and Water Security Concepts. Springer. p. 331. ISBN 978-3-540-68488-6. Retrieved 13 April 2013. ^ a b Small Arms Survey 2012: Moving Targets. Cambridge University Press. 31 July 2012. p. 99. ISBN 978-0-521-14687-6. Retrieved 13 April 2013. ^ "1954 map of South Sudan by tribe". South Sudan Stories. Retrieved 13 April 2013. ^ Deng, Lual A (25 January 2013). The Power of Creative Reasoning: The Ideas and Vision of John Garang. iUniverse. p. 174. ISBN 978-1-4759-6028-0. Retrieved 13 April 2013. ^ Newton, Michael (2009). The Encyclopedia of Unsolved Crimes. Infobase Publishing. p. 4. ISBN 978-1-4381-1914-4. Retrieved 13 April 2013. This page was last edited on 15 February 2019, at 04:58 (UTC).